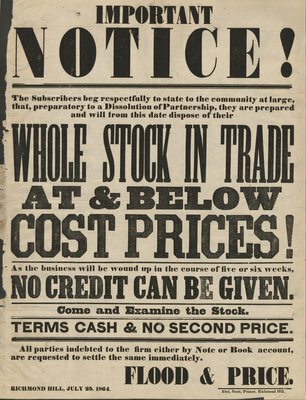 This is an original poster with the announcement of farm stock sale in Richmond Hill on July 25th, 1864. All parties indebted to the firm either by Note or Book account, are requested to settle the same immediately. RICHMOND HILL, JULY 25. 1864. Protected by copyright: Uses are subject to the terms of a licence. Contact the repository for further information. Responsibility for any use rests exclusively with the user.